Thanks to technological advances and new understanding of the spine and nervous system, we are now able to correct the spine and use pre and post x-rays to document this change. These changes are achieved through a series of specialized gentle adjustments. If we are able to accept your case, a care plan will be recommended based on the pre-existing levels of degeneration in your spine, your age, levels of activity, and your response to an adjustment. Not every spine is correctable, so we always start with a checkup to evaluate your potential for success in our office. 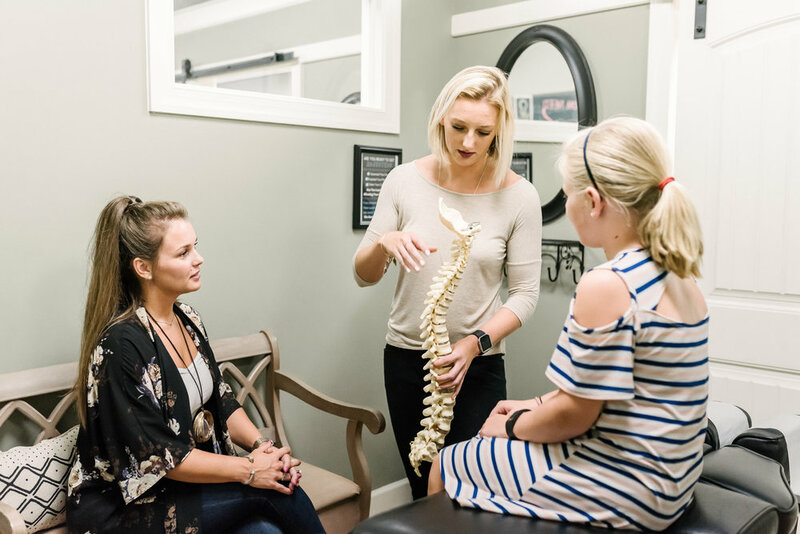 When a person seeks chiropractic care and when their chiropractor accepts them for chiropractic care, it is essential that they are both working toward the same goal. Traditionally, the focus of health care is centered around a person's symptoms and the treatment or relief of their symptoms. This is the entire basis for relief care. Today, chiropractic care is very well known for its ability to provide relief care. It is often referred to as miraculous in it’s ability to provide relief where all other forms of health care have failed. Although many chiropractors specialize in and are extremely successful with providing relief care, this was never the intended purpose for chiropractic. From it’s inception over 110 years ago, chiropractic was designed to be a Principled form of health care. The goal or objective of chiropractic is to identify the underlying cause of a person health challenge and to correct it. A condition of the spine known as vertebral subluxation complexes (aka subluxations) interfere with the body's natural ability to heal itself. Principled and wellness chiropractors locate vertebral subluxations, thoroughly analyze all of its components, design a specific program of adjustments to correct vertebral subluxations. Most importantly, this is done to help you and your family learn how to achieve a state of optimal health and how to maintain a healthy spine into the future. To fully appreciate and understand this difference and the importance of principled care let’s start by looking at the difference between “symptoms” and “warning signs”. The difference is best understood through a simple comparison. If a person sprains their ankle and they experience pain in their ankle – this is a direct relationship. The location of pain and the location of the injury are the same. This is a classic example of a symptom. However, if a person is suffering from heart disease and is experiencing pain into his left arm – there is likely nothing wrong with the left arm! This is a classic warning sign of a problem with the heart. It would seem quite silly – even foolish – to spend a tremendous amount of energy and resources treating a persons arm pain when the cause of this pain is coming from the heart. Things work very similarly with the spine – if a vertebral subluxation is affecting the spine and causes pressure on the nerve going to your leg, over time you may begin to experience leg pain (commonly called sciatica). We could examine and treat the leg but we would be doing so ineffective because this was just a warning sign telling us of the problem in the spine. Depending on which nerve(s) in the spine is being affected it will vary what type of warning sign you may experience. Fortunately or unfortunately there is often a significant time delay between the onset of subluxation and the first warning signs. This happens because of our bodies have an amazing ability to adapt to both it’s internal and external environment. For example, if you have a pebble in your shoe – you don’t lean on it – you lean off of it and your body behaves very similarly in relation to vertebral subluxations. Very commonly, one of the first vertebral subluxations to occur in the spine is in the neck. This is for a variety of reasons including the fact that the vertebra, ligaments, and muscles in the neck are the smallest and the head (in particular in children) is disproportionately heavy in comparison to our body. Small slips and falls as a child or even the birth process itself can result in the vertebra of the neck becoming displaced or subluxated. The body will work very intelligently and will change your posture to accommodate this change. This can result in shifting the head to be in front of the shoulders and leaning the head to one side or the other. The body does this in order to reduce the pressure this subluxation is putting on the spinal cord. As a result of this change in head posture, our rib cage may bend or shift to reduce pressure on the spinal nerves. Similarly, the big muscles of the lumbar spine and pelvis will compensate to further reduce the unwanted pressure on the spinal nerves. For our body, this is a much better state than suffering the immediate and devastating affects of spinal cord and spinal nerve pressure. The trade off is that it leaves the pressure on the vertebral discs imbalanced and causes them to begin wearing out at a progressive rate. It is usually not until the discs of the spine begin to wear down and the body begins losing it’s ability to naturally compensate that we start seeing the intermittent warning signs related to subluxation. Quite often the first place in the spine to begin to fail and lose its ability to compensate is the lumbar spine. This is because all of the forces of gravity within the body affect the lumbar spine and we often use our lumbar spine to lift things that would be no problem for a healthy spine but with vertebral subluxation degeneration has weakend the spine over time. Things which we originally used to do with ease, we may start avoiding because when we do them now it causes pain. This avoidance is often the result of continued degeneration as we ignore the warning signs our body is giving us. In this situation if we begin treating this person’s lower back pain without thoroughly analyzing their Vertebral Subluxations and never find that the cause was actually coming from a vertebral subluxation in their neck – we may be able to temporarily relieve their lower back pain but it will only be a matter of time before it returns because the back pain was simply a warning sign. Principled and wellness care chiropractors specialize in detecting, analyzing, correcting or in some cases minimizing vertebral subluxation. Our education programs are designed to help you heal as fast as possible and to achieve a state of optimal health. Most importantly, we will help you learn how to keep your spine and the spines of your family healthy into the future. We specialize in principled and wellness chiropractic care. We provide specific, scientific, chiropractic adjustments over time and with repetition to correct the cause…the vertebral subluxation. We get amazing results and we look forward to serving you! At the University of Pennsylvania, Dr. Henry Winsor conducted an experiment based on chiropractors claim that by adjusting the vertebrae they can relieve stomach troubles, ulcers, menstrual cramps, thyroid conditions, kidney disease, constipation, heart disease, lung and other diseases. In this experiment, he dissected both human and animal cadavers to see if there was any relationship between any diseased internal organs discovered on autopsy and the vertebrae with the nerves that went to the organs. Dr. Winsor dissected 75 human and 72 cat cadavers. He found nearly 100% correlation between minor curvatures of the vertebrae and diseases of the internal organs. Make Your First Appointment Today! *By submitting this form, you are granting: Crossroads Chiropractic permission to email you. You may unsubscribe via the link found at the bottom of every email. Check Our New Patient Special Offer!